In 1890 Count George Leo Caprivi de Caprera de Montecuccoli, a German soldier and statesman negotiated an boundary treaty with Great Britain which provided for a corridor from the northeastern corner of South West Africa to the junction of the Chobe and Zambezi Rivers. The purpose for this unusual boundary adjustment was to provide a commercial outlet for German trade in minerals. By granting the adjustment the British were able to block German efforts to acquire a link between South West Africa and her east coast colonies. The strip is 20 miles wide between the Okavango and Cuando rivers. At its widest point, along the Cuando River, it is about 60 miles wide. Its length is about 280 miles. 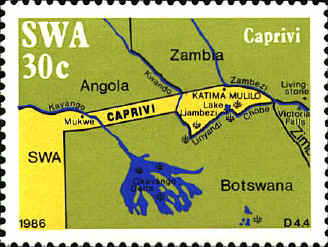 The stamp was issued in 1986 by South West Africa which had not yet relinquished control over the land.